Best Western The Dartmouth Hotel 3* is rated 4.0 out of 5 based on 2 verified reviews from YGT customers. Best Western The Dartmouth Hotel is one of the South West's most comprehensive golf resorts, boasting two tremendous courses, the Championship and Dartmouth, both of which are constructed according to USGA standards. The Dartmouth has been included in Golf Monthly's list of Great Britain and Ireland's best 80 courses. Located in south Devon, less than 15 minutes from Dartmouth town centre, Best Western The Dartmouth Hotel enjoys a stunning country location, an ideal place to escape to. The excellent accommodation at the hotel is paired with The Dartmouth Spa and Bar & Bistro to complete the experience. The par-72 Championship Course has hosted the West Region PGA Championships on no less than six occasions. The 7,200 yard layout is set up to provide a stern test for even the most skilled players, with strategically positioned tees making for difficult driving. 12 water hazards are integrated into the course to guard the undulating greens and fairways. The par-66 Dartmouth Course is a more relaxing and manageable test than its neighbour, but is built and maintained to equally high standards. With water threatening on a number of occasions, the Dartmouth is no walk in the park, but is great for larger groups as it is suitable for all golfers. Dartmouth's Head Greenkeeper was selected to represent England and Ireland in the finals of the ‘Toro' Award for Excellence in Greenkeeping, explaining why the greens at Dartmouth are so excellent. 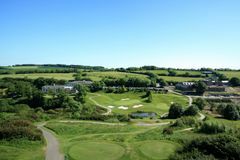 The excellent three-star hotel at Dartmouth boasts 35 excellent en-suite bedrooms, all linked directly to the clubhouse, and is set in the midst of some 225 acres of delightful Devonshire countryside. The rooms are decorated in a traditional style, but are fitted with all the requisite modern amenities to ensure that visitors to Dartmouth experience the best in comfort. Many of the bedrooms afford outstanding views over the golf courses to the rural surroundings, while the outstanding service will make all visitors feel entirely welcome and relaxed. The Dartmouth Spa is incorporated into the hotel, and features an indoor swimming pool, sauna, steam room, jacuzzi, sun shower, sunbed and a splash pool for the kids, while the fully air-conditioned gym is well equipped for some serious training. For those in need of pampering, Dartmouth Spa has a full range of treatments to suit you. Dartmouth's newly opened clubhouse Bar & Bistro serves a range of snacks, light bites and meals during the day, and an exquisite a la carte menu for dinner, utilising the area's array of locally sourced produce. I set off from Sussex on the 1st September heading for a three night stay at the Dartmouth Golf & Country Club and I'm happy to report the club was really easy to find, with a lovely entrance and a long, sweeping drive up to the hotel. A warm welcome greeted me at the reception desk where I checked in and upon getting to my room I was somewhat surprised, but delighted, to find my room was in fact a suite! This made for an extremely comfrotable stay and a great start to the trip. I chose Dartmouth because I was able to meet up with old friends with whom I could play golf. The golf course here is beautiful, with fabulous views over the Devon countryside. The long walks between tees were fairly steep in places and I discovered muscles in my legs I never knew I had; a buggy would come highly recommended from this weary golfer! I was blessed with beautiful weather too so the course was a joy to play and I really enjoyed meeting up with old friends for a game. The food at the resort was delicious and I can honestly say the breakfast I had was one of the best I have ever tasted. The staff were very friendly and helpful too which made for a really nice stay at Dartmouth Golf & Country Club. For a quite, no frills weekend of golf, Dartmouth ticks all the boxes. We have recently returned from a weekend golf break to the Dartmouth Golf & Country Club and I must say; we were thoroughly impressed. Finding the golf club was easy, as I had the aid of a GPS device and getting there was a pleasant drive. The championship golf course was lovely to play on but we all found it very steep to climb especially between the holes, at times it was very hard going. On reflection we would love to play this course again but we would need to use buggies! The Dartmouth course was much more enjoyable for our group as it was more relaxing and suited our level of play. The tees and greens were in much better condition than the championship course which was in good condition itself. The clubhouse was very welcoming to all with a fresh smile from reception every time I entered. In fact, the atmosphere in the hole resort was great.We had an evening meal, breakfast and lunch on the second day. I must say the food was excellent every time and so was the service...top marks! Our biggest smile came when we entered the lodge, WOW what a place, very modern, clean, spacious, the bedrooms were lovely with a beautiful balcony. Rest assured I have recommended Your Golf Travel to many many people and will without doubt be using you again for our next golf break...hopefully sooner rather than later!